The Locomotive Manufacturers Association dates back to 1875 when a number of independant locomotive manufacturers grouped together to petition Parliament. At the time the independant locomotive manufacturers were suffering greatly as the railway companies were increasingly setting up their own locomotive works. On learning that the London & North Western Railway were supplying locomotives to the Lancashire & Yorkshire Railway and were looking at supplying to other railways Charles Sacie of the Yorkshire Engine Co in Rotherham wrote to many of the other independant locomotive manufacturers and a meeting was called on the 29th April 1875. Representatives from Avonside, Vulcan Foundry, Neilson, Manning Wardle, Dubs, Kitson, Beyer Peacock and Sharp Stewart were present. J.H.Kitson of Kitson & Co made a motion, seconded by Sacie, that each company should contribute to a fund to take action to prevent further inroads into their business by railway company works. It is the opinion of this meeting that it is now necessary to take steps for the protection of engineers and others against the competition of railway companies as manufacturers for sale. Richard Peacock of Beyer-Peacock. The first meeting of the new LMA was held in London on 4th June 1875 and a committee was elected composed of various company managers. Hunslet Engine Co and Hawthorn Leslie joined at the meeting of 16th July 1875 with Fox Walker joining in the November. Justice Sir J Jessel found in favour of the manufacturers on 16th December 1875 and the action resulted in a High Court injunction preventing railway company workshops from manufacturing locomotives for sale or hire and effectively limiting them to supplying their own locomotive needs. This restriction survived until the Transport Act of 1968. The success of this action persuaded the companies involved of the importance of having a formal body for their mutual benefit. It was decided at a further meeting on 31st March 1876 to make the association permenant. 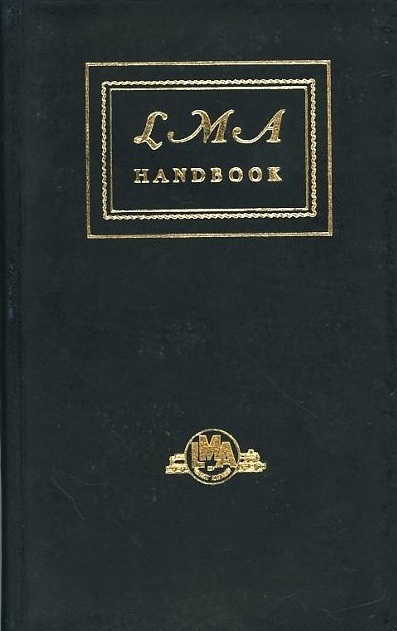 Right - A 1949 copy of the leather bound LMA Handbook that would no doubt have been found in the drawers of many works managers desks. In March 1876 it was decided to fund the association by charging a levy on member companies of nine pence per man employed Membership was soon widened to include manufacturers of all forms of rolling stock and components. The industry went through several periods of boom and bust and during hard times the association tried to share out orders in such a way as to ensure work to the firms that needed it most. In the depression of the 1920s and 30s that saw a lot of the independant manufacturers disappear the association was important in reorganising the struggling industry. While some companies couldn't be saved their designs and goodwill could be passed on to other companies within the association thus helping other manufacturing firms. Levys charged on some orders amongst LMA members helped to subsidise others, helping the British manufacturers remain competetive against tenders from overseas firms. In 1957 the organisation changed its name to the Locomotive and Allied Manufacturers Association and in 1971 it was changed again to the Railway Industry Association. The Railway Industry Association survives to this day, it's role as important as ever following the fragmentation of the railway industry following the privatisation of the 1990s.